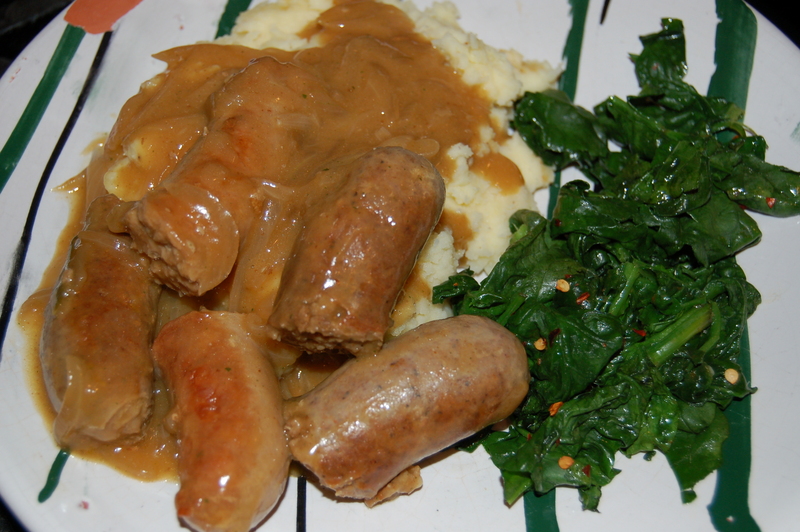 Tuscan-Style Sausages with Rich Onion Gravy, Mash & Spinach (serves 6-8) | Crappy Kitchen - Good Dinners! I must be feeling the shiver of winter because my last few dinners have contained a hearty quality I am not drawn to when the weather is warmer. The changes in the season are visible to me every time I walk from the backdoor to my car via the garden. Right now my poor basil plants are all but dead and I am kicking myself for not getting that last good harvest picked for some extra jars of pesto to cheer me up when the bleakness of January hits. 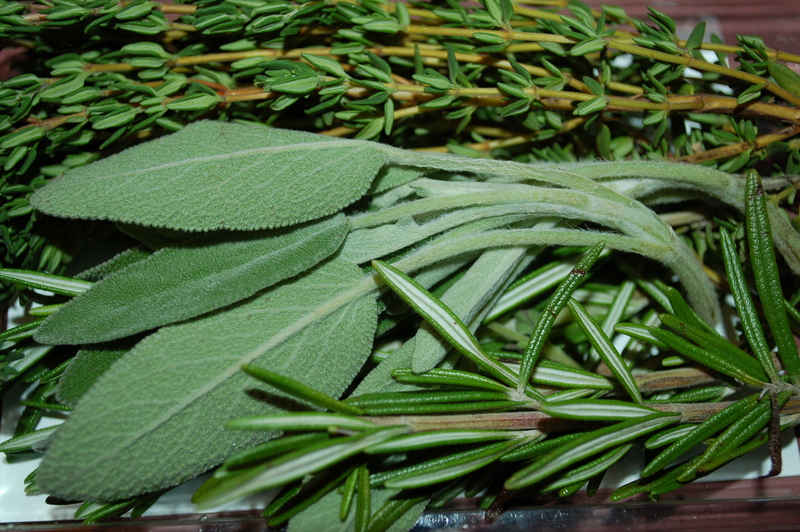 The earthier herbs are still determined to brave it out and it is their flavors that have influenced the kinds of things I have been feeling like cooking lately. 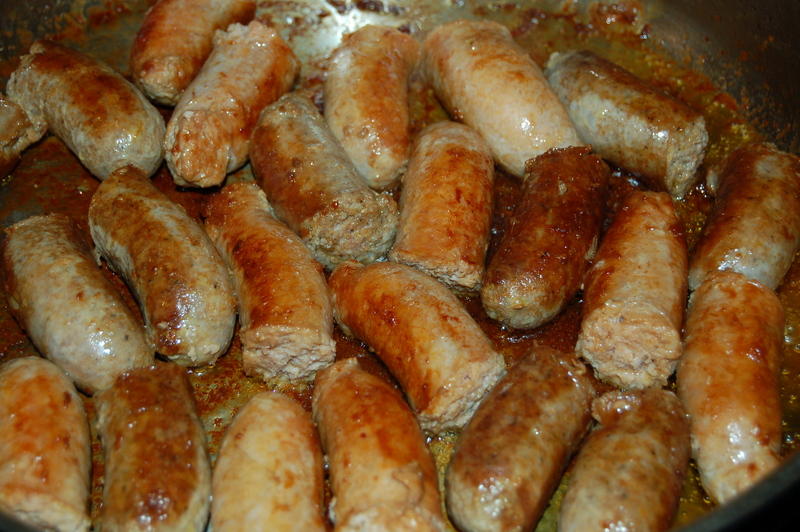 Sausages with rosemary infused onion gravy – nothing like it! Yesterday I found a new style of sausage at my most favorite supermarket (I must write about it someday soon), an organic “Tuscan Style” sausage no less, and if there is any word that conjures up gastronomy in all it’s glory for me it is Tuscany! (there are some other words of course but this one is in the top five!). 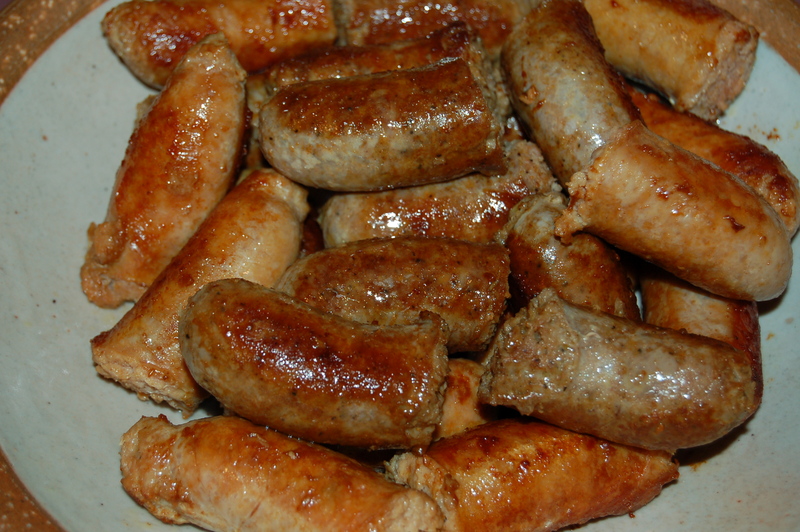 What made this sausage “Tuscan”? The words “spezza forte” on the package was a start but I wanted to make sure it wasn’t some marketing ploy intended for lovers of all things Italian like me! So from my limited experience of living there last year and my determination to make a stab at learning or at least understanding the language I knew it loosely meant “strong spice” So what does that really translate into in North American? To this particular set of test/marketing chefs it meant cinnamon, cloves and nutmeg but being that this sausage is made to please a huge cross-section of people the Tuscan flavor as I know it was rather mild (even thought they did get the spices right on). I am probably going to have to make the sausage myself if I want the real deal. What I am trying to say is that if you are going to make this any good quality sausage will do but if you happen to be lucky enough to go to a real Italian market where the meat is from the source then you will have the best dinner ever! We had this with a big side of quickly sautéed spinach and it was the perfect thing! 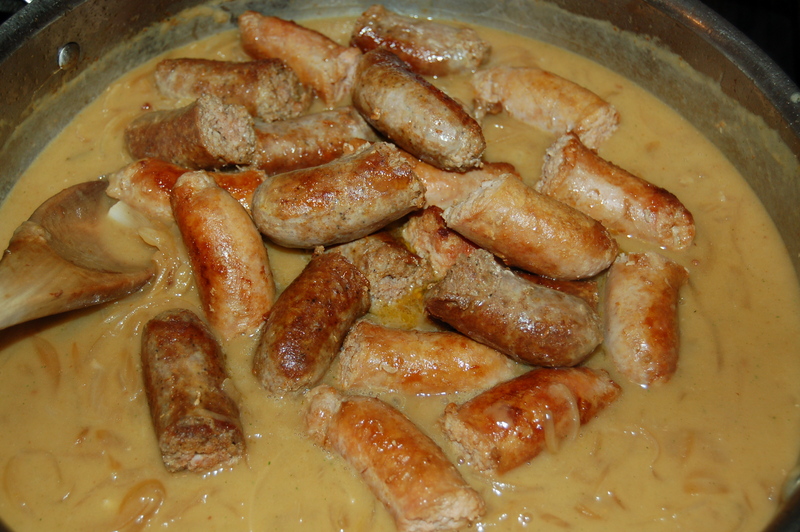 This dish was really all about the sausages and gravy so once you have that I’d say feel free to serve it with anything you like, or whatever you can scrounge from your fridge or pantry. Spinach grown from seeds from Naples by my friend Catherine on her farm a few miles from me! 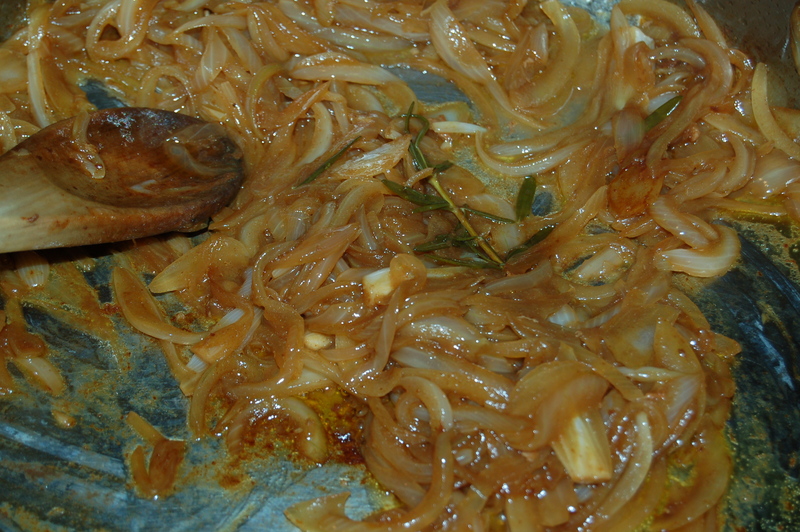 2 – Add some more oil to the pan (about 1 tbs) and add the sliced onions and sprig of rosemary. Turn the heat up to medium and cook stirring occasionally for about 10 minutes. Reduce heat, cover with lid and continue to cook until onions are nice and soft (about 10 more minutes). 3 – At this point the onions will have turned a lovely caramel color and picked up the scrapings from the sausages. Add the butter (*and the stock cube if you are using stock cube plus water instead of broth) and when it melts add the flour and stir very well with a wooden spoon. Add a cup of broth (or water) and continue stirring into a smooth sauce. Add the next 1 1/2 cups of water and let it come to a boil. Turn heat down until it has stopped boiling and continue to cook and stirring on and off for about 5 minutes. 4 – If you want a thinner sauce add another 1/2 cup or so of water or broth and let it get hot. Add liquid until you are happy with the consistency. Next add the sausages back to the pan and turn down heat to lowest setting. Keep warm until ready to serve. 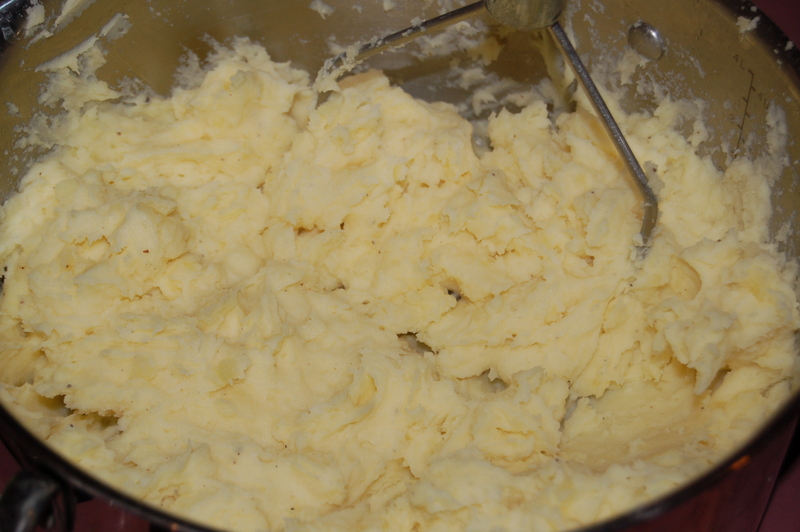 for the mash: put the prepared potatoes into a pot and cover with cold water. When the pot comes to a boil, cover with lid and boil gently until potatoes are cooked all the way through (a knife should be able to go through a potato very easily). Drain water and add the butter, milk or cream, 1/2 tsp salt and several grinds of black pepper. Mash until there are no lumps and you have a nice smooth mash. cover gently with a tea towel and set aside until ready to serve. for the spinach: Put a big pan on low to medium heat right before you are ready to serve. Add the spinach and sprinkle with the seasonings (salt, pepper, chili flakes). It will wilt quickly. Before it seems cooked turn the heat off. it will continue to cook while you get everything served. 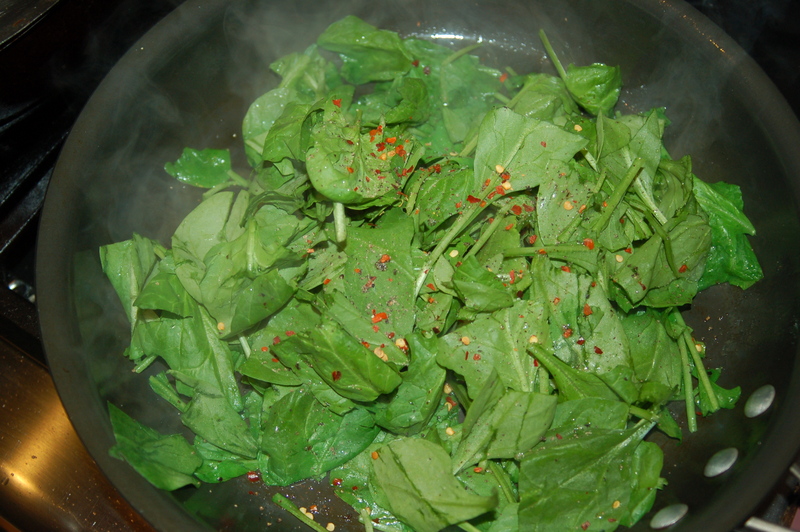 Saute spinach with oil and pepper flakes for 1 minute.. 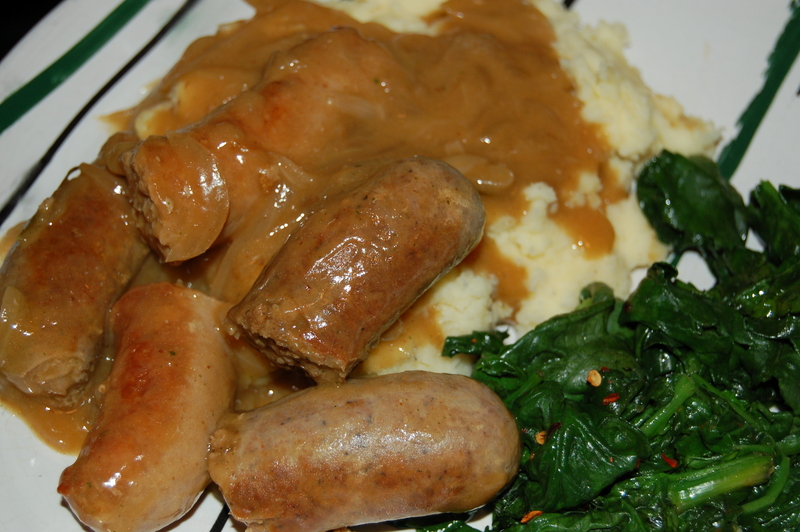 This entry was posted in dinners and tagged flavored sausage, italian sausage, lucca, mash, mashed potatoes, onion gravy, potatoes, sausage, sausage & onion gravy, sausages, sauteed spinach, seasoned sausage, tuscan style sausages, tuscany. Bookmark the permalink. What a belly warming dish!